Poët Laval is located 100 km from Avignon, 170 km from Lyon or Marseille (2 hours by car) and less than 3 hours from Paris (TGV), 5 hours from Brussels or Amsterdam (TGV). 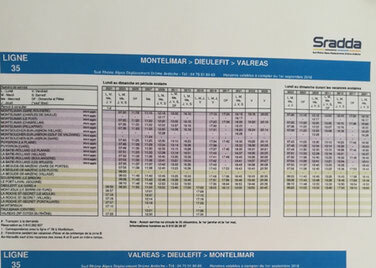 By train: Main TGV stations in Valence or Montélimar (then bus, carpooling, taxi or car rental). Montélimar station is 30 minutes by car from Mas des Vignaux and Valence TGV station about 1 hour. By plane: International Airports in Nîmes, Grenoble, Geneva, Lyon, or Marseille. By car, from Paris, drive on highway A7, exit at "Montélimar Nord". From Montpellier or Marseille, exit at "Montélimar Sud". Then follow the signs "Dieulefit". Poët Laval village is located 4 km before Dieulefit. Arrived at Poët Laval, on the departmental (D540), turn right towards GOUGNE and follow the signs "Les Vignaux" then turn left and cross the old bridge. Immediately after the bridge, turn left onto Jabron Road, stay on the small road that runs along the river. 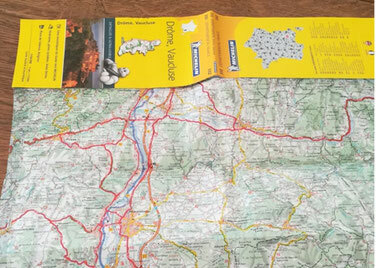 At 500m, you will find the Mas des Vignaux on your right. Please note that the last bus leaves Montélimar Station at 6:15pm (please check it as it changes seasonally). From the bus stop Poët-Laval-Gougne to Mas des Vignaux it is ten-minute walk through the village and the fields. Cross the river Jabron on the small wooden walkway .